Earlier this week, Whole Foods market announced that they would be building a store in Downtown Los Angeles. The new grocery will be located inside a future high rise where Bottega Louie’s parking lot currently stands, but that project is still several years down the road. Urban Outfitters is way ahead of them. Three months ago, the funky store announced their new downtown location would be open before the end of the year. 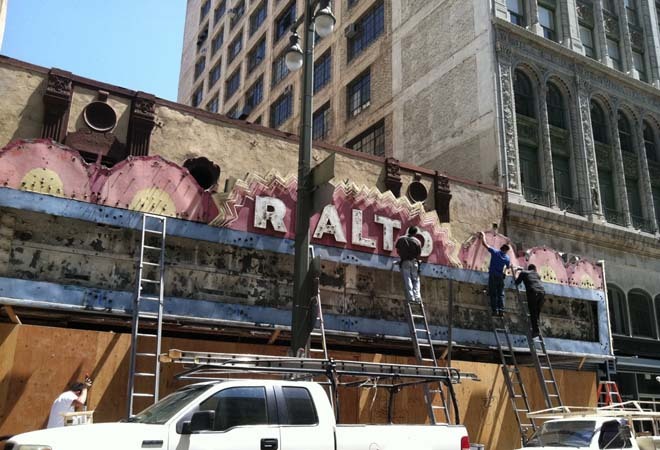 I was skeptical of the deadline, considering that their new home, the 1917 Rialto Theatre on Broadway, had been gutted in 1987 and needed a complete makeover. Check out that photo above and you’ll see how quickly they’re progressing. Downtown has some of the most beautiful buildings in the city. Things are changing so rapidly, and historic details hidden for decades seem to emerge every week. There have been many transformative moments on Broadway since the Bringing Back Broadway initiative launched in 2008, but this combination of national chain in a historic space will become the simplest way to explain downtown’s transformation to people that still don’t get it. For better or worse, this one shop could unleash a tidal wave of change on one of the city’s most important streets. I was surprised to see an army of workers scrambling around that massive neon marquee recently and was amazed at the progress. Signs usually come last. I can’t wait to see what treasures they found hidden inside that ancient movie house and am thrilled to know that this fiery neon will soon blaze back to life.